“SOLO” officially helped Jennie surpass senior Taeyeon and became the most-watched MV of a female solo artist. 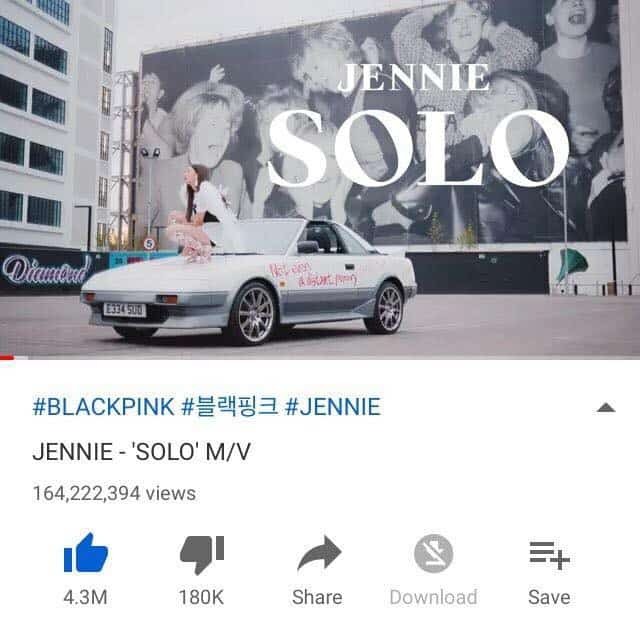 On January 14, Jennie‘s “SOLO” MV officially exceeded 164 million views on YouTube after more than 2 months of release. Thus, “SOLO” has officially surpassed Taeyeon‘s “I” to become the MV of a Kpop female solo artist to have the most views at the moment. “SOLO” reached the milestone of 164 million views, becoming the MV of a Kpop female solo artist with the most views at the moment. Although Jennie faced a series of attitude and dating controversies, she excelled in setting up a new achievement, confirming the leading position in the Kpop nowadays. Before that, “SOLO” also used to be the fastest MV of a solo artist to achieve 100 million views. Thanks to the catchy melody and eye-catching choreography, “SOLO” is Jennie‘s solo debut masterpiece. Jennie is increasingly asserting her position in Kpop thanks to the impressive achievements made in the past time. Will Shin Ryujin, Hwang Yeji and Lee Chaeryeong able to make JYP’s new griup into a success without Somi?